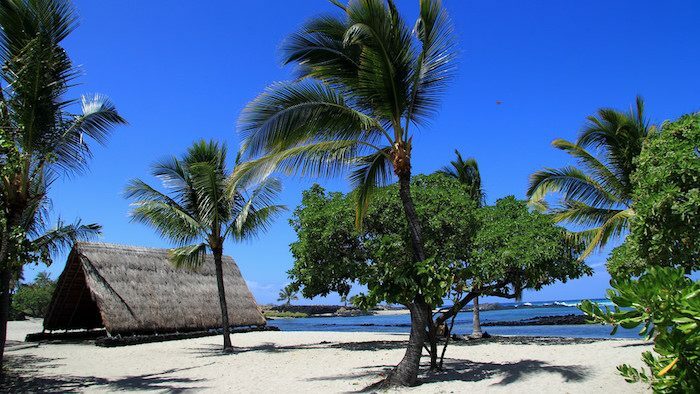 This is one of the best beach/waterfront running options on Hawaii. The Natural Energy Lab administers the Hawaii Ocean Science and Technology Park, just to the south of the airport on Kalihi Point. Here, there is a solid 4 mile out and back through the park and over the compact sand of the beach. Start about one mile south of the airport and turn makai (towards the ocean) on Kahilihili Street. At the stop sign, turn right onto Makako Bay Drive and follow that road out to the ocean and park. From the shore, you can run to the left (south) on a sandy beach for two miles before doubling back. Add-Ons: You can add on several extra miles on the paved streets of the Natural Energy Lab (another area covered in the Ironman World Championships). There isn’t much of a shoulder here, so do beware of traffic (which isn’t too bad). Or, continue on the trails of Kaloko-Honokohau National Historical Park, which is 4 miles south of the Energy Lab (you’ll have to run on a trail on the the outskirts of the Kohanaiki Golf Course).